“Government is looking at how best we can take those monies and invest those monies for the people of Barbados,” Senator Jepter Ince told the gathering in the Unity Bar at DLP headquarters in Belleville, St Michael. You remember Senator Jepter Ince, don’t you? Qualifications? Hell – he should be under investigation for the CLICO Fund debacle! This man is talking about protecting Bajans by properly investing our yet-to-exist oil revenues. Jepter Ince – who destroyed the life savings of countless old folks by advising them to invest in CLICO. Jepter Ince, who advised old folks to mortgage their home to borrow money to invest in the future with CLICO. Ince was appointed by now-dead PM David Thompson – probably to keep him quiet. CLICO and CL Financial. What a scam – including money laundering by Prime Minister Thompson from a company where insiders took bribes to have the company purchase land for way more than market value. Mr. Ince, why don’t you tell us what returns you’ve achieved for your clients since you created the CLICO Balanced Fund in 2000? How did all those folks do who borrowed money from you to invest in your fund so you could put that money back into Clico? Huh? How did they do? The contempt of the elites for the rule of law continues in the CL Financial scandal. In any large scale fraud upon the public, initial Profits are privately owned by the elites who did the fraud. Later Losses are publicly owned. There will be zero accountability or transparency by the elites charged with “getting to the bottom of things”. No elite is ever charged with any crime, except if it is really necessary. In that event, the police are given marching orders and not enough time and resources to complete the task. The accused will be found ‘not guilty’ in a fair trial before a carefully selected judge. “I’m sure there’s some good legal reason why High Court Justice Kaye Goodridge ordered the Barbados Police to put the CLICO criminal charges on hold. Always is some good legal reason for doing what is done. And like we’ve said at BFP before, it’s a good thing that Prime Minister Thompson died before the public knew of his role in money laundering millions of CLICO dollars for his close friend Leroy Parris. Afra Raymond is one of those good citizens looking for justice for us all. Here we are, at what the authorities hope will be the two closing acts of the tragedy known as CLICO. Firstly there is a final push, through a device going by the name of NEL2, to extinguish all rights and claims of EFPA holders. Secondly we shall witness the winding up and consignment to the dustbin of history, that once all powerful company called CLICO, along with all its books and records. This article is headlined NEL2 Con but you will have to bear with us while we explain the context in which the con is to be executed. It would be impossible to achieve this masterpiece of deception without all that went before it. Sam Lord’s Castle has been owned by CLICO for almost ten years (memory fails – if someone has the exact date CLICO purchased Sam Lord’s, speak up please) and is an incredibly valuable piece of property if developed. 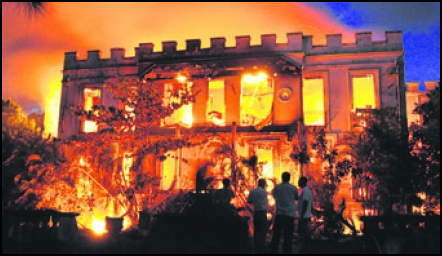 The hold-up to development approval was always the historic Sam Lord’s Castle building, but just as Barbados Free Press predicted in April 2009 – a fire took care of that little impediment. If anything, the burning of Sam Lord’s Castle raised the end value of the land because the historic building was totally destroyed and ceased to be a major political obstacle in new development. Only the facia remains and this could be incorporated into any new structure if it doesn’t totally fall down first. With the collapse of CLICO, the DLP government moved to grab the asset. They didn’t move to protect the public interest in the historic building before the CLICO collapse because Leroy Parris, David Thompson and the DLP were tight as thieves and the idea was to allow Parris to let the building fall to ruin, then maximize the profit from the lands. And there was also that one little sticking point about the DLP never acting responsibly at the time to protect the interests of Bajans: Prime Minister Thompson and Leroy Parris were godfather to each other’s children. Thompson was also CLICO’s lawyer for over a decade when the company failed to file financial statements and broke the law, and CLICO Parris et al were major financial contributors to the DLP. 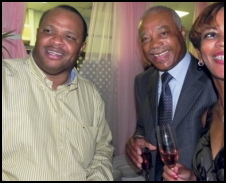 CLICO was a very messy conflict of interest indeed for Thompson and the DLP. Fortunately for the DLP though, David Thompson is now conveniently dead and revered instead of being subject to what would have been a tsunami of Opposition attacks over the CLICO cover-up and conflicts of interest. Now the DLP government is going to take Sam Lord’s and sell it to make some good profits. Or… perhaps sell it to friends at a low price so the friends can make the profits and kickback some contributions to the DLP. That’s how things work around here, you know. The Barbados Government will never pay CLICO for Sam Lord’s Castle. No matter whether the asset is fairly valued or under-valued, not one dollar of government money will be transferred to the assets of CLICO where the money could benefit the victims. Instead there will be some finagling with the books and some credit or swap against CLICO’s real or contrived debt to the government coffers. The pillaging of the good CLICO assets continues to the ultimate detriment of the poor suckers who believed that the Barbados Superintendent of Insurance and the Barbados Government were looking after policyholders’ interests. Parris and his gang were able to do what they did only because they had the cooperation and friendship of Caribbean governments. Indeed, it could truly be said that in the case of Barbados, CLICO, Parris and Thompson owned the DLP government. Policyholders: kiss your assets goodbye.